In this month’s guest post, we learn from digital marketer Emily Weston about how to use SEO to communicate more effectively about your organisation. Search engine optimisation (SEO) is not as complicated as big digital marketing agencies like you to believe. It’s simply: things you can do to your website to get Google to notice you, and trust that your website is relevant to a search query. Think about Google’s motives. Why do you use Google instead of Yahoo or any other search engine? It’s likely because you trust Google. You know that nine times out of ten when you hit that search button you’re going to get relevant results. Google wants you to keep relying on them and trusting them to give you what you want. To do that, it has to be a bit picky about which websites appear when you search. 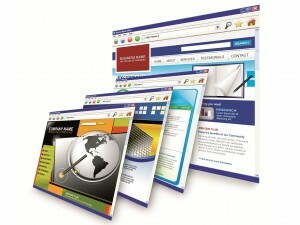 So how can you prove to Google that your website is great? The simple answer is, provide loads of great content. That doesn’t mean fill your website with fancy words and special moving images. It means communicate what you have to offer, clearly and explicitly. After hearing about SEO, many people fall into the trap of thinking they need to fill their website with keywords. While it is true that you need to have a few keywords/phrases in mind when you’re creating content for your website, SEO is much more about communication and user experience. The Google spiders that crawl the internet to find great content are smart. They recognise synonyms, so there’s absolutely no need to overuse keywords on your website, plus it’s against Google’s policy so it can get you in pretty big trouble if you try it. Imagine that one person that has found you through Google, what did they search for? What question might they have asked? What exactly do they want? The most important thing you can do for your business is to be relevant to your target audience. Once you’ve worked out what your audience wants, think about how you can communicate that on your website. If it’s a service or product you offer, do you talk about it in detail on your home page? Communicate what you offer in your website content, your blog posts, even your social media con-tent. All of this helps you prove your relevance to Google. You need to engage your audience, to do that you need to be easy to understand. It’s time to forget what your English teacher taught you about creative writing. Most people find it difficult to digest big chunks of text on a screen, so naturally we scan text on websites. So avoid long, complicated words and paragraphs. Summarise your points and be sure to describe what your audience is looking for. This website was displayed at the top of my search results because it’s filled with great content about yoga. I’ve taken a screenshot of the top of the page and highlighted the keywords and phrases that have been used by this company. 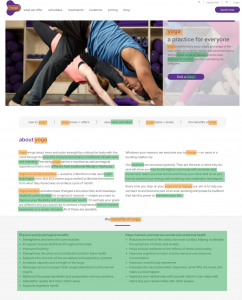 The orange highlights are to show you where ‘yoga’ has been used, the green highlights shows similar and relevant terms that this company’s audience are likely to be interested in, and could be searching for. Notice all of the relevant content just at the beginning of the page? The website tells you everything you need to know about yoga and has a range of classes in London – which is exactly what I was searching for in Google. I’d recommend trying this yourself, how much of your webpage could you highlight orange and green? It’s also useful to take a look at what your competitors are doing. How are other businesses in your market providing great content? Although it’s often seen as scary territory, SEO forces you to think about your audience and how you can serve them well. You know what you can offer to the world, all you need to do is communicate it.